I remember watching my mother stop her work and grab the binoculars as she noticed a flash of color in the trees outside our home on the farm north of Taber, Alberta, Canada. Since then, I too keep my binoculars and bird book handy. And it's no different here in Kenya. 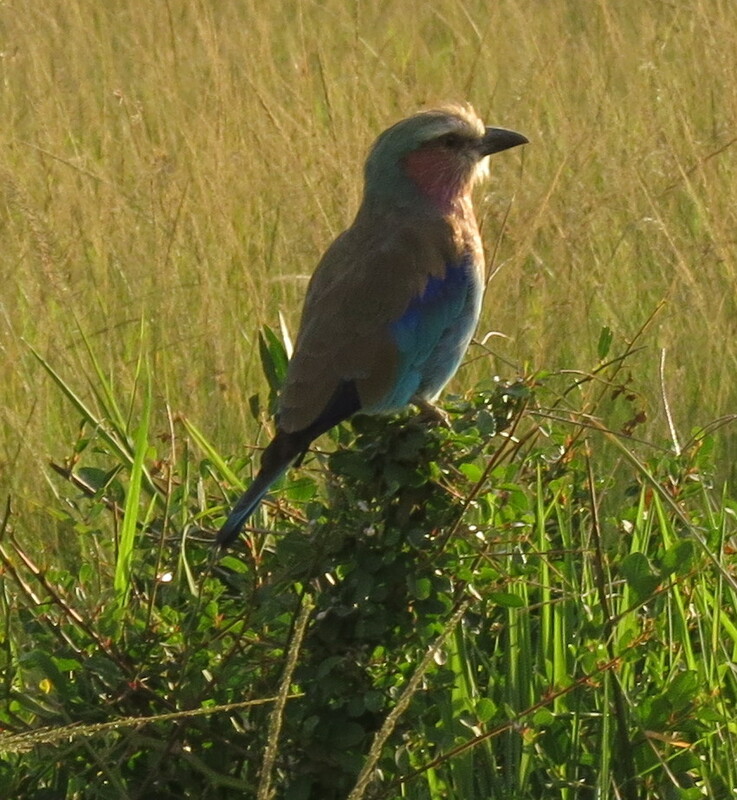 I was so pleased that our guide at the Masai Mara, Harrison, knew the names of the birds that we saw in the Masai Mara. Just wish I could remember all he told us. 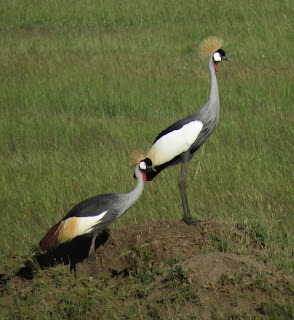 My favorite birds are now the crowned crane and the lilac breasted roller. See end of the post for gorgeous pictures of the lilac roller in flight. I saw it in flight but couldn't take a picture fast enough. The Crowned Crane has become my favorite bird here in Kenya. Click to enlarge. Love the crested hairdo and the lovely colors. 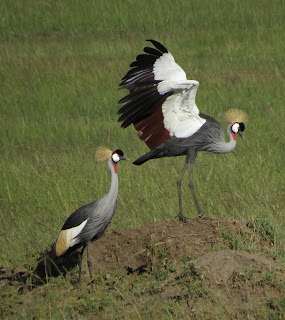 Look how striking the Crowned Crane is as it flaps its wings. The Crowned Cranes act like they are posing for a photograph. So striking! And now the one on the right has straightened out its neck as if to say, "Look at me!" Yes, I could look at you for a long time. We saw many Crested Cranes. Love the way they hold up one leg. I took several pictures of these cranes and it was hard to choose what photo to leave out. People have raised ostriches in Alberta, including our neighbor, the Layton family. But it's so nice to see them in their native habitat. Love that long neck and tiny head. 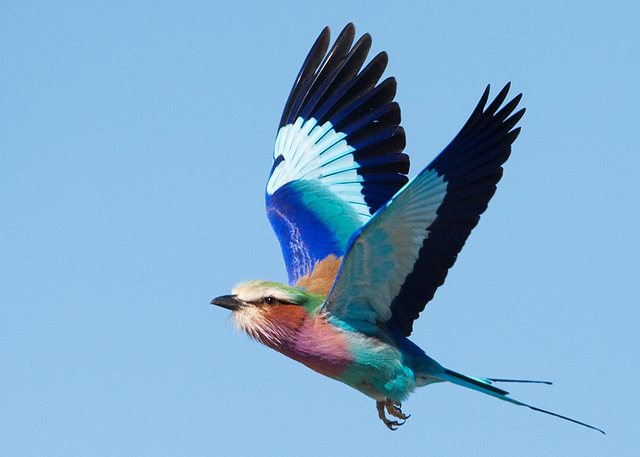 The lilac breasted roller is a striking bird, especially when it flies. Gorgeous! The lilac breasted roller is sitting in a sausage tree. The real name of the tree is "kigelia" but it is called a sausage tree because of the sausage-like fruit that you can see in the photo. The fresh fruit is poisonous but can become edible by drying or roasting. 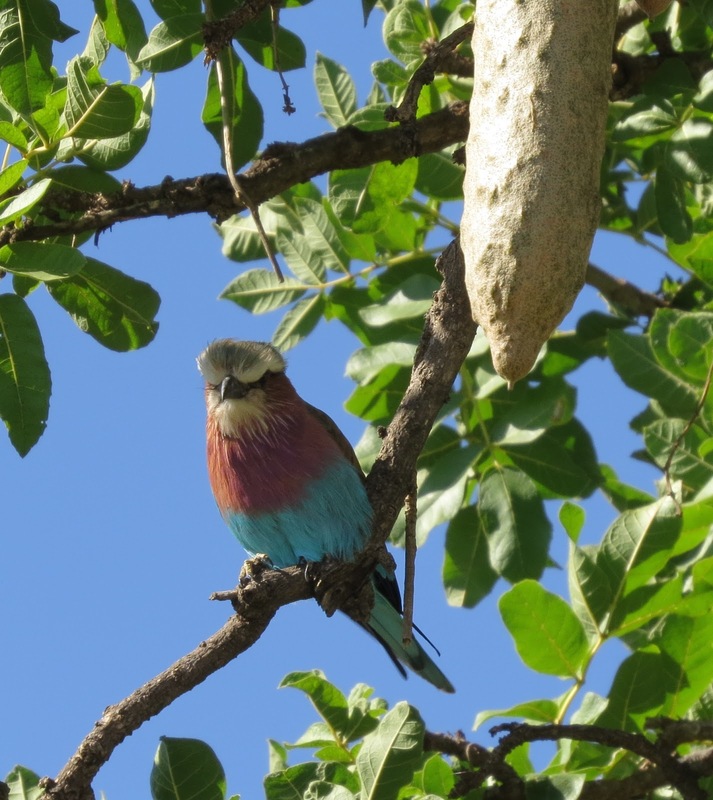 Another view of a lilac breasted roller. Not a fantastic picture, but you get the idea. 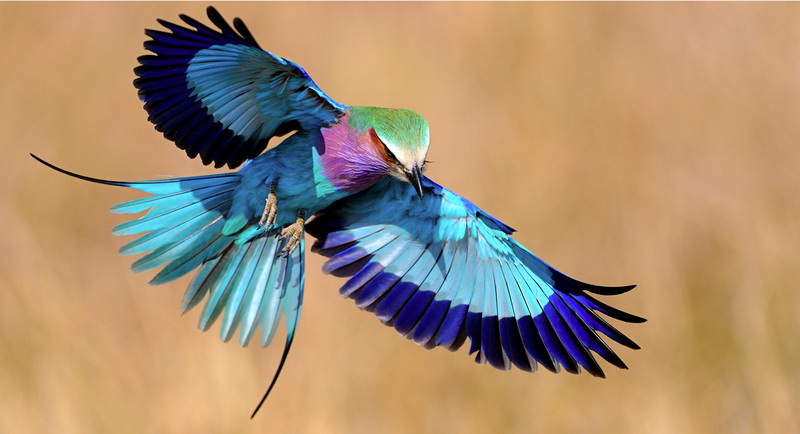 These birds are gorgeous in flight. See two pictures at the end of this post. They are not mine but I did see them flying. 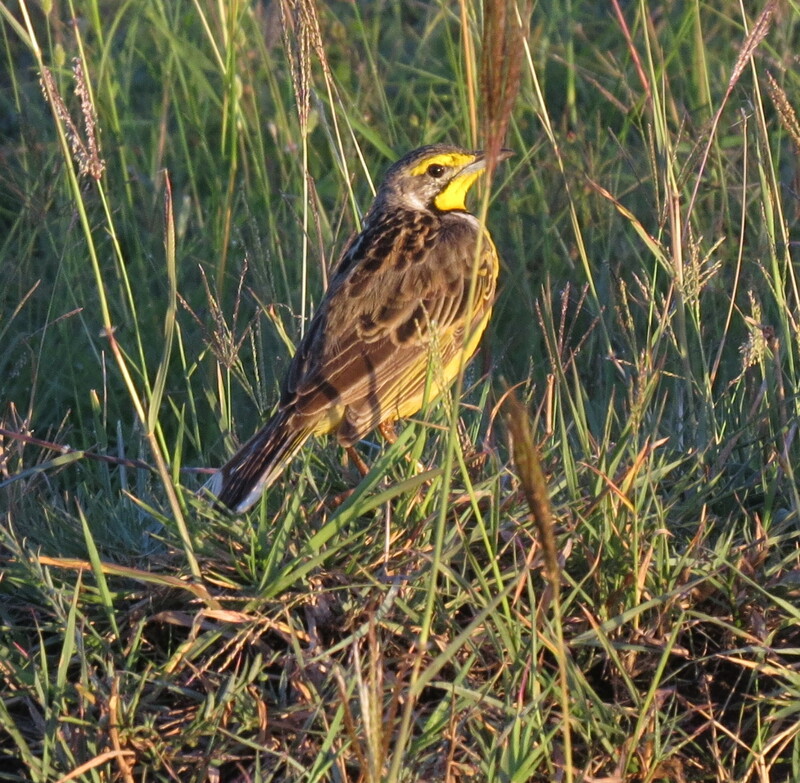 This looks almost like a meadow-lark. I haven't been able to discover what it's called. Help me out, someone out there. I did a search by dropping the photo into an image finder and the best guess was that "this is a bird!" Very helpful! 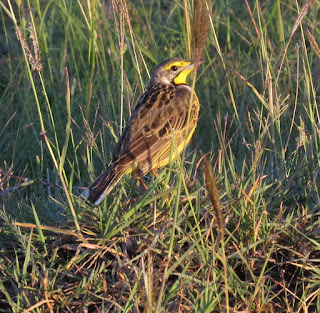 My niece Nancy discovered that this is a Yellow-throated Longclaw. Thanks, Nancy! 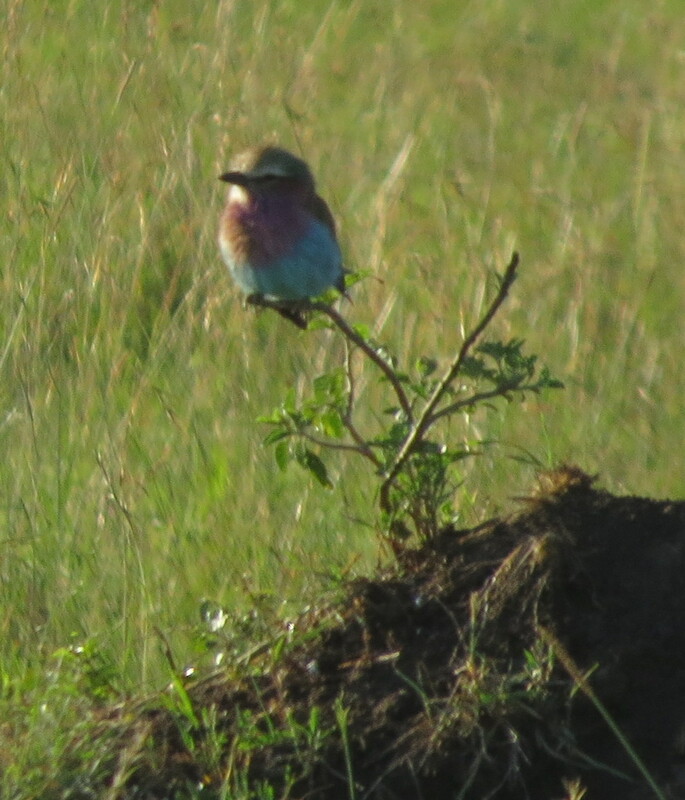 And yes, from the front it does look like a meadowlark. This is either a Martial Eagle or a Snake Eagle. I can't see its legs so I don't know for sure. 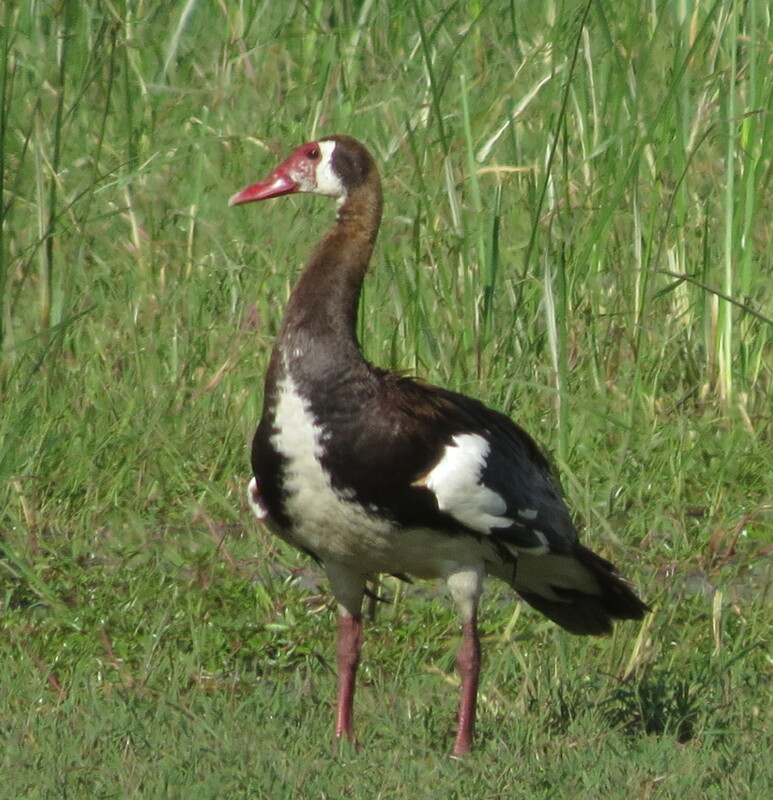 This white stork has an injured leg. The pink one is the good one and the white one is the injured one. This reminds me of a little killdeer from back home but is actually a spur-winged plover. 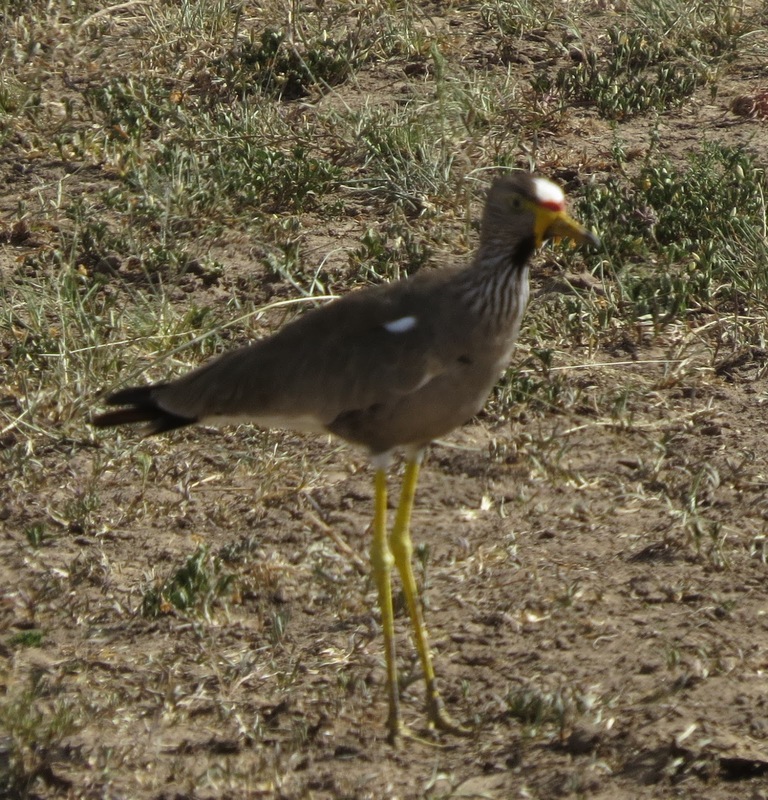 The yellow legs and the bright white spot on the forehead identify this as an African Wattled Plover. Looks like the camera focused on the background instead of the bird and I didn't notice. My eyes are getting worse. 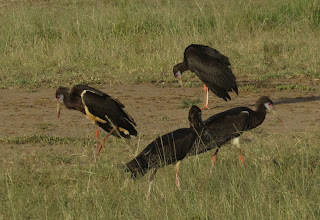 We see hamerkops from time to time near where we stay in Karen in Nairobi. 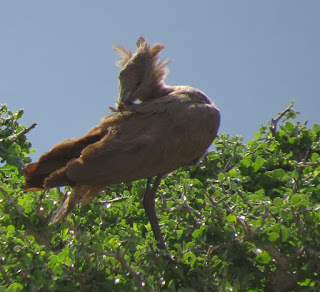 Hamerkops build gigantic nests. 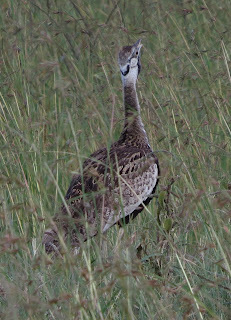 The thick backward pointing crest makes it easy to identify. 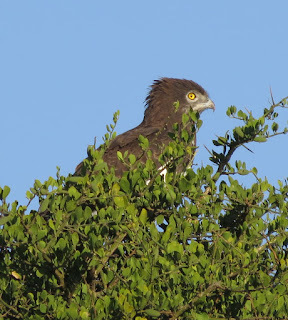 African Fish Eagle. Love the background. 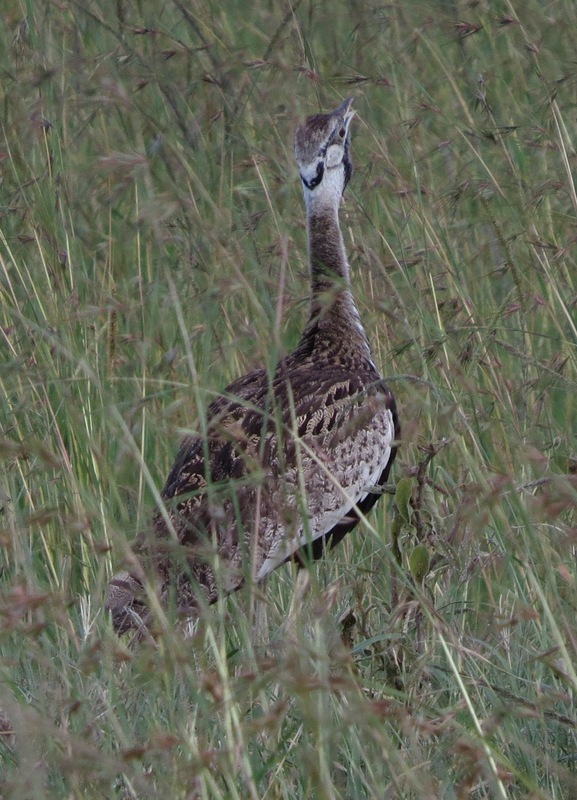 I need help identifying this bird also. Click to enlarge this picture. 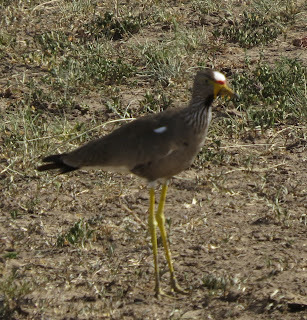 This is a yellow-billed oxpecker. Its bill is basically yellow with a red tip. 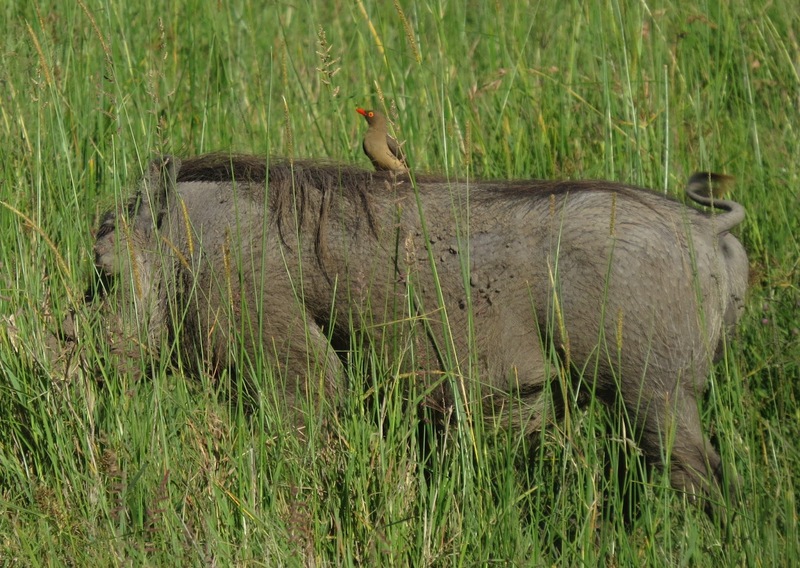 Oxpeckers eat ticks and other insects harmful to animals. 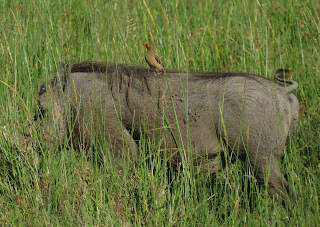 This oxpecker on the back of a warthog is a red-billed oxpecker. Its bill is entirely red. Click to enlarge. 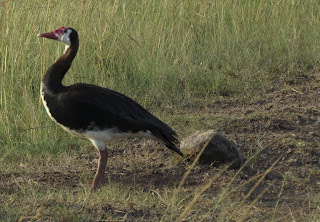 Need help identifying these birds too. I'm fighting a cold and my head is thick. I'll keep trying to track them down. Again, google image finder says "best guess is that it is a bird." Once again, my niece Nancy has identified these birds. They are storks. Somehow I thought they would be some kind of vulture. 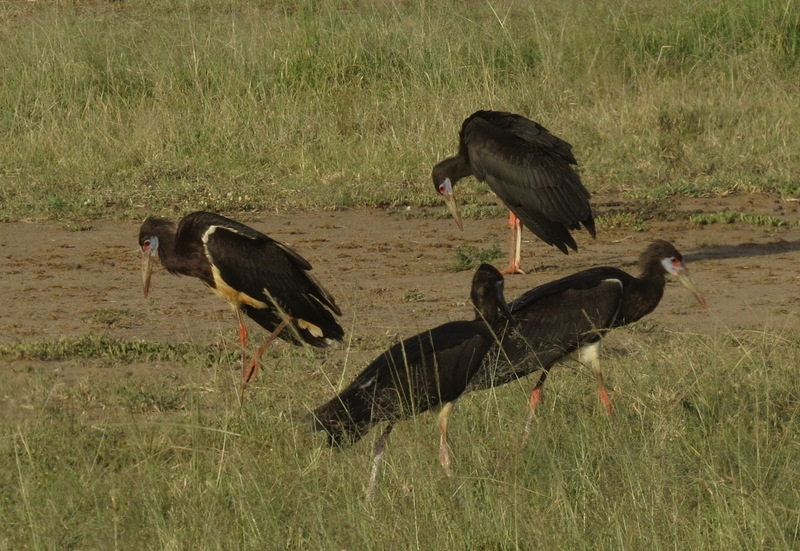 But no, they are Abdim's Storks! These final two pictures need to be identified also. They are the same bird. Thanks to my niece, Nancy, these birds are spur-winged geese. Good job, Nancy! Lilac breasted roller in flight. Not my picture but I did see them flying and this is what they look like. Another picture of the lilac breasted roller which I did not take. Gorgeous! The stork is Abdim's Stork (https://en.wikipedia.org/wiki/Abdim%27s_stork). Such beautiful birds! Thanks for sharing them all! The kids said they're, "very, very colorful and AWESOME!"